STEF'S Fabrication Specialties offers many oil pan types and designs for most forms of motorsports. Check out the Recently Listed Engine Oil Pans. Pit Stop USA is The Online Motorsports Superstore! We feature Lifter Valley Vent Tubes at low everyday prices. Pit Stop USA is The Online Motorsports Superstore! We feature Oil Pre-Heaters at low everyday prices. Pit Stop USA is The Online Motorsports Superstore! 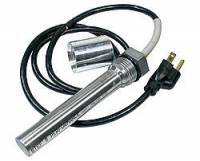 We feature Oil Restrictors at low everyday prices. Pit Stop USA is The Online Motorsports Superstore! 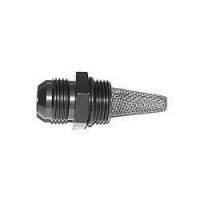 We feature Oil Tank Fittings at low everyday prices. Pit Stop USA is The Online Motorsports Superstore! 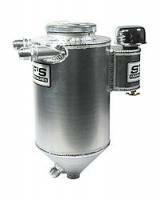 We feature Oil Tanks at low everyday prices. Pit Stop USA is The Online Motorsports Superstore! We feature Transmission Pans at low everyday prices. 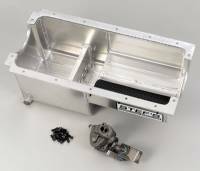 Stef's Drag Race Aluminum Dry Sump Tank - 5 Qt. 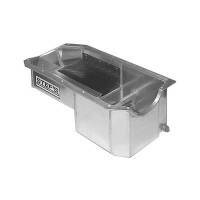 - 7" Diameter x 17"
Stef's SB Chevy Aluminum Oil Pan Kit - w/ H/V Oil Pump- LH Dip. Stef's Teflon Coated Screen 12" x 24"
Pit Stop USA is The Online Motorsports Superstore! While STEF'S Fabrication Specialties offers many oil pan types and designs for most forms of motorsports, they all share one thing in common; method of manufacture. All STEF'S oil pans are fixture assembled and 100% heli-arc welded inside and out to produce a fully fabricated product. Unlike some brands which use OEM, IMPORTED, or OEM look-a-like dissimilar material thickness cores as their foundation, STEF'S Fabrication Specialties method incorporates true finish and fitment component construction, offering matched material thickness for uniform weld penetration and the absence of mismatch or excessive material overlap which can trap dirt and debris during manufacture and operation. All STEF'S oil pans, whether constructed of steel or .090" thick aluminum, offer reinforced pan rail and seal areas that are all block fitted prior to leak testing. For the circle track, marine, and/or any other type of steel oil pan,an additional internal welding process utilizes a special asoft-wirea welding process. This concept is considerably more forgiving to vibrational movement and is more crack resistant than other processes like MIG welding used by other oil pan manufacturers. It is STEF's Fabrication Specialties commitment to produce only the finest oil system related products for their customers. . . .That's a promise!! We feature STEF's Late Model Dry Sump Oil Pans and STEF's Stainless Steel Oil Restrictors at low everyday prices.